At the South Sutton, Cheam and Belmont Local Committee meeting on 7 September our main decision was to install a vehicle operated sign in Farm Road to reduce speeding. Richard lives round the corner from Farm Road and vehicles certainly speed down it. This complements other measures in the Ward to reduce speeding, in particular in Cavendish Road and Cedar Road. 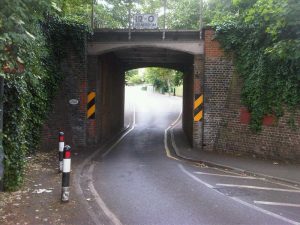 We also agreed to install a width restriction at the point in Grange Vale where the road passes under the bridge. The speed of vehicles has a safety implication for pedestrians walking west to east on the narrow pathway, particularly if pushing a buggy. We also agreed to plant a replacement for the vandalised tree in Willis Avenue. The committee also agreed Richard’s proposal to purchase from the Royal British Legion a “Silent Soldier” and install it in the flower beds in front of Northumberland House. These are large silhouettes of soldiers, designed to be installed through 2018 in prominent places to remind us that this is the centenary of the conclusion of the Great War. We hope the parking consultation will now take place much earlier than anticipated.